Rancher comes in two parts (the first being optional). You have the Rancher Distro and the Rancher Orchestration Tool. The first part is the Rancher Distro. This is pretty awesome. I know, “another distro” I can hear you say - but this is pretty clever: it is a distro for Docker. It is built entirely on Docker in that you can replace the core parts of the system with a simple command which swaps the core part out by stopping the current Docker container with the new option running in Docker. Want to use the Debian, Ubuntu or Centos console for example, you can do. Configuration is easy enough too as it uses a cloud-init based configuration which is a standard for system templates. Note that this won’t be required in this walk through. This way, when you provision the new server, you will have your ssh key set up straight away on that instance. This can extend to things like DNS settings, static IP addresses and so on. I’ve used this locally on my HP Micro Server and it worked really well but my home connection was a dynamic IP address and the server is not much of a spec for what I wanted. So, if you have a server at home you can replace the Digital-Ocean parts with the steps you need to run on your server. Alternatively, if you have Virtual Box or similar installed then you can grab RancherOS and try it out. The second part is the management portal. This is the UI that allows you to manage multiple hosts with multiple containers. I have three hosts currently, one which runs my Rancher Orchestration Tool and Kanboard and another for my GitLab instance. The third is for someone I manage a website for. When running Rancher you are able to manage all your containers on a single host but are still able separate them out. These are called stacks. As you can see above (fig 1.1), I have two stacks. The first is for my certificates via LetsEncrypt and the second is my GitLab stack, this contains GitLab, a runner and the load balancer. I am able to drill down into each service and modify as I need (fig 1.2). You can manage the container by restarting, stopping or deleting it as well as executing the shell and viewing the logs (providing the container has been set up with logs being sent to stdout and stderr) (fig 1.3). You are able to then drill down further into the container to see system statistics and other information (fig 1.4). One of the favourable parts of Rancher from my point of view is the upgrading process. Out of the box, it supports Blue Green Deployments. In a nut shell, it allows ease of rollbacks when deploying new versions of software whilst harnessing the power of Docker. For example; if I have a web site and I want to change the background from white to grey, I build the docker image via my CI pipepline and then deploy it via the Rancher API and tell it to not finish the upgrade process. As you can see in fig 1.5, I have two containers which are both the same application but different tags. 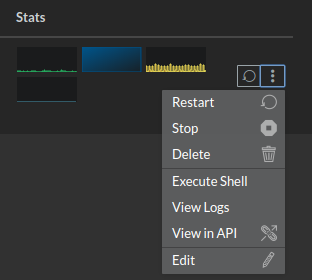 If the new tag was broken for what ever reason after the deployment then I can easily rollback to the last working state by clicking on “Rollback” on the context menu for the service (fig 1.2). The Rancher API is very powerful and allows you to do a fair amount of automation with it, which is great from a DevOps point of view. To help with this there is a great tool out there cdrx/rancher-gitlab-deploy where if you use Docker as part of you pipeline, you are able to run this to do most of the communication to your Rancher API. and then point to localhost and you should see the UI ready for you to set up. I’m not going into it more than that as they have so much to give - including an amazing range of community tutorials to help you along (which have helped me a numerous amount of times). The following section is for people with a Digital-Ocean account. If you don’t have one, I have a Digital-Ocean referral link which will give you $10 credit. It really is cheap to spin up droplets, even if you wanted to try something for a few hours. Select a project you already have or create a new one for this particular exercise. The next part is important, “Add your SSH keys”. On this particular Droplet you must use your (local) SSH key otherwise you will not be able to create the Droplet. If you haven’t uploaded one yet, click the “New SSH Key” and you can paste the contents of you public key within this process. Please remember to only paste the contents of your .pub key. Now, hit that “Create” button and you will be taken to your project page with the Droplet having been created (fig 2.2). Once you Droplet has booted, copy the IP address and you should now be able to SSH into your local machine with ssh rancher@<droplet-ip-address> and you will be asked the following, type in “yes” and you should now be logged into you Rancher OS droplet. The authenticity of host '<droplet-ip-address> (<droplet-ip-address>)' can't be established. ECDSA key fingerprint is SHA256:ABC...XYZ. After about a minute or 2 copy the IP address in your Droplets dashboard and paste & go in your browser and you should see a “Welcome to Rancher” modal (fig 2.4). Now you have it up and running, you need to set up your instance. Point something like infra.your-domain.com at your Droplets IP address and then add that in the “Host Registration URL” under the “Something else” input (fig 2.5). Save that then you are ready to set up security. In the top menu you will see “Admin” in there, then you should see “Access Control”, click it. Here you have an array of options (fig 2.6). I’ve gone with GitHub as I am able to manage users with ease when I need to add/remove access. Once you have followed the instructions for your preferred method, you are now ready to add a host. The path I am taking is with a new host via Digital-Ocean for simplicity. Create another Droplet within your project and this time select “One-click apps” and select “Docker 17.12.0~ce on 16.04” and select the 1GB, 1vCPU for $5.00/mo. Once that has generated take note of the IP address of the new Droplet. Within Rancher, select “Infrastructure” > “Hosts” and select the “Add Host” option (fig 2.7). You will notice that there are 4 options to create a host - these are Machine drivers. 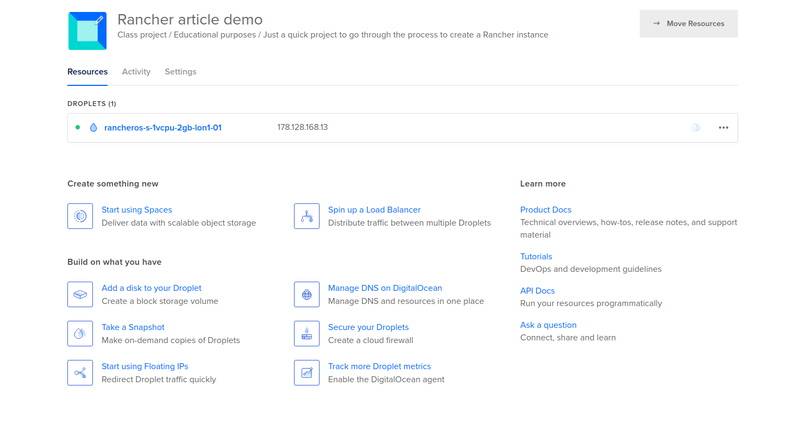 They allow you to connect to your infrastructure with ease, so for example; we’ve created a Droplet via the Digital-Ocean dashboard where we could use an API key for our account and to have Rancher create is for us… Awesome! However, I would like to go with creating it via Digital-Ocean so we understand what is happening under the hood. Type yes and you should now be logged into your droplet. Now paste the command you copied from your Rancher UI and you should now see that host appear in your Rancher UI. Now we are going to set up our first deployment of an app. We are going basic and will deploy WordPress. Click on “Catalogue” and search for WordPress. When you’ve found it click on “View Details” and leave fields as they are with the default values and click “Launch”. You should now see something similar to fig 2.8. Once the status’ on the left column are all showing as “Active” then head over to the IP of the new host. Go to /admin for the admin panel and use “admin” and “bitnami” as the username and password. 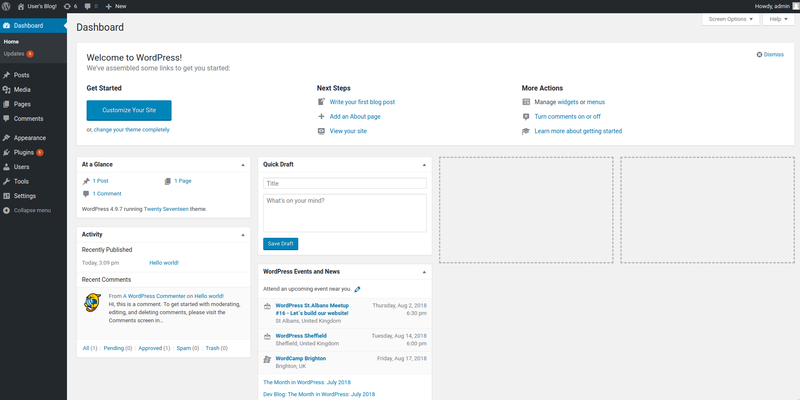 You should now see the WordPress admin panel like below (fig.2.9). If so you have successfully deployed your first app via Rancher, congrats. Please don’t forget to destroy them Droplets!! You can do this by selecting the “Destroy” option in the Droplet’s context menu [fig 2.10].